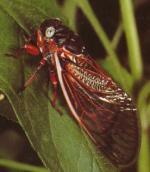 Cicadas of the genus Magicicada appear every 7, 13 or 17 years. The fact that these are prime numbers has been regarded as a coincidence. We developed a model with predators (X) and prey (Y) including mutations and selection. We showed that prey (cicadas) with prime cycles are selected (see example a) below) in order to optimally escape predators. Changing our intentions from biological to number-theoretical, we set arbitrarily large initial conditions and could thus use this model as a generator for very large prime numbers (for example, in the figure b) below, the Euler-prime E is selected). 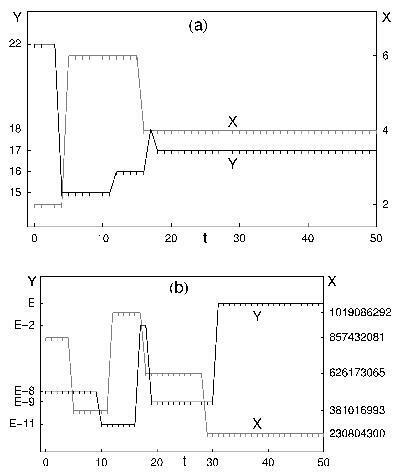 E. Goles, O. Schulz and M. Markus, "A biological generator of prime numbers", Nonlinear Phenom. in Compl. Syst. 3, 208-213 (2000). In the web. 142. M. Markus, O. Schulz and E. Goles: Comment on "Emergence of Prime Numbers as the Result of Evolutionary Strategy". Physical Review Letters 95, 229891 (2005).